In keeping with the bird theme this week, I am noticing that the backyard predators are becoming patio and deck predators. They must be running out of field mice, voles and other rodents down in the meadow. 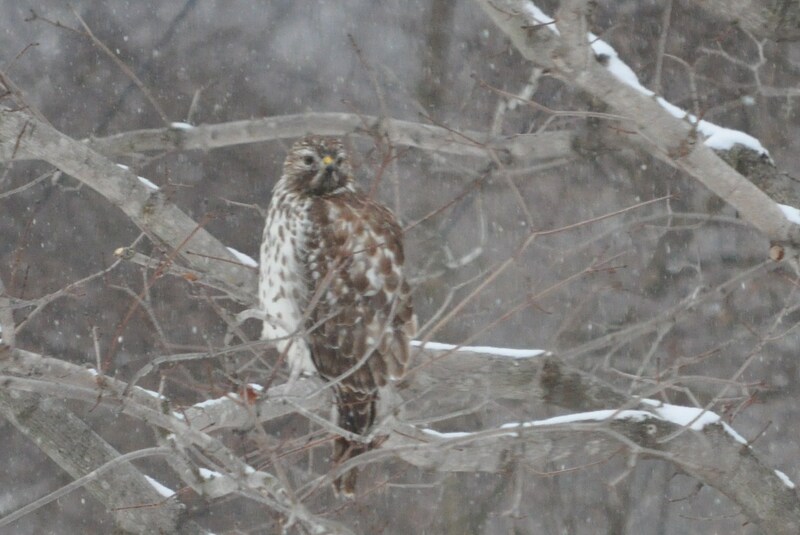 Friday the young Cooper’s hawk decided to hang out in the maple tree off our patio and watch the happenings. What is interesting about this predator, the birds don’t seem to care about him. He is looking for bigger prey usually. While he was there the juncos just remained in the burning bush. 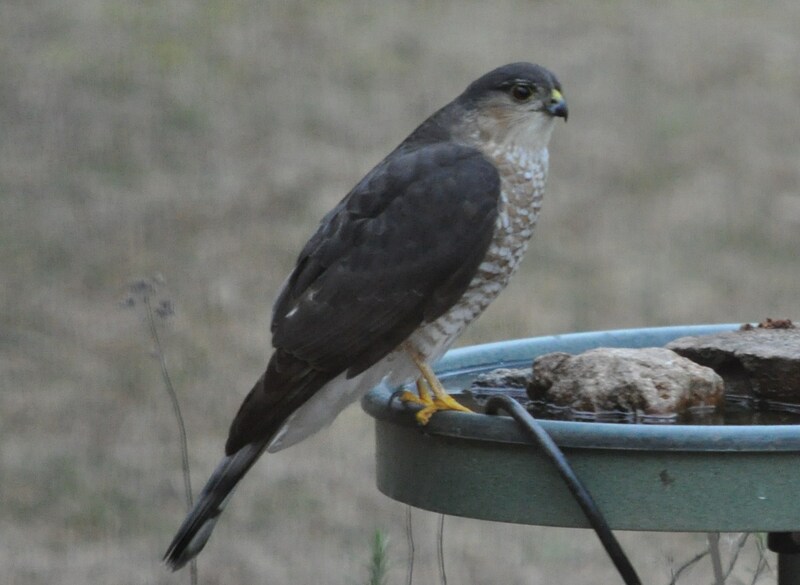 Now today, the sharp shinned hawk felt like making the bird bath his perch in case any small birds were inclined to show up. He didn’t even flinch as I took at least a dozen pictures of him through the patio door. He was about 25 feet away from our door. He causes the most havoc around here. Swoops in low and at high speed and the birds scatter. Occasionally one hits a window in their panic and he gets an easy meal. It is the trade off here. No cover in the winter on the deciduous trees and bushes, so the birds are more vulnerable. I do know this year the two of them are doing a very good job at keeping mice out of the house. The population must be smaller due to their constant hunting in the garden and the meadow. I have only trapped one this winter. Usually I have at least half a dozen squeezing up through the openings to the crawl space under the washer and dryer. We have to have traps in the laundry room all winter. This year either the warmer weather, or the presence of two predators is keeping them at bay. It took me a while to get used to them when we moved here. Being up close and personal to acipitors is just part of the whole experience in this rural setting. Posted in Birds, Nature, West HoCo and tagged birds, nature, photography, West HoCo. Bookmark the permalink.